This was their 4th Album, and the first one I listened to, and if I remember one that I played on an almost endless repeat when I was doing some tedious and long work in the garage, more exactly , sanding back a table for re-varninshing, hot dusty musty tedious work. This is an album of music where the lyrics display an absolutely mastery of story telling, and it’s backed by music that is accomplished and well polished. 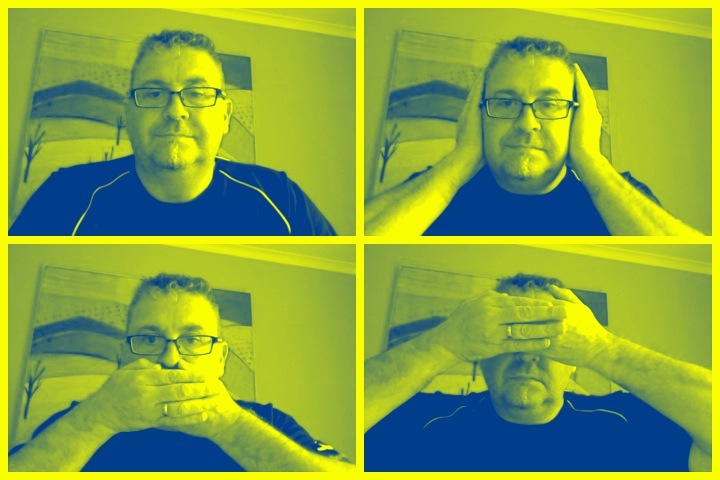 Seems like every time I listen I pick out a new phrase and a different track that hits the resonate button. What is my friend trying to prove? And then come around to the March 2012 MrsPdubyah and me, well we see them live at the Powerstation a venue in Auckland that holds about 900 people. It was a magnificent gig, and they were supported by an Australian band “Bear and Boy” who were also quite good and had a couple of catchy tracks and some great arrangement of musics going on. I like Elbow so much that I imported a box set of theirs from the UK that had all there previous albums in it. Madness then and on reflection madness still, but it has a great collection of music that are by-and-large well crafted and eloquent, romantic and sad as well as uplifting and happy. Skilfully sung too. There are two version of this album, the studio one and the abbey road one, they are both equally as impressive, and as with a lot of modern bands the live version sounds a lot like the studio version, possibly to do with the money made by touring as opposed to album sales and you have to sell what you sound like. It’s a great night in, although the problem I have with the album is that they are pressed as doubles and that means a lot more flipping and swapping, that and they play at 45 and not 33, it’s a small price to pay for enjoyment, but it could have been better. 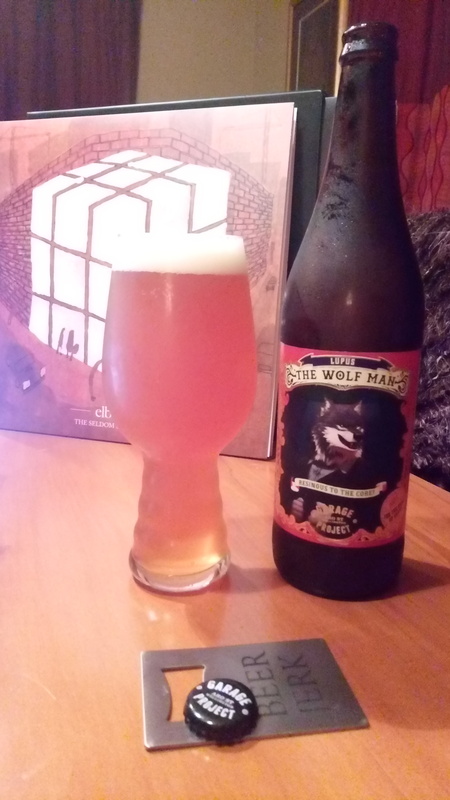 is a Garage Project – Lupus the Wolf Man a 9.5% Double/Imperial IPA in a 650ml bottle. I’ve had this on tap and it was magnificent then. Brewed for a Beer Festival they’ve found the occasion to make this again, which suits me fine. What a glorious aroma from this, and it pours pretty as a picture and sits in the glass with a lovely stark white head of foam, and it’s so inviting. Dark hazy orange inviting. Tastes every bit as you hope it would with piny resinous bitterness over a lovely malt that provides a full mouthfeel that I thought led with orange and citrus, and sensational flavour bursts. Finish is nice too and not at all dry. Nothing about this suggests that it’s a beer of higher ABV and it’s alarmingly easy to drink quickly, but then who’s judging me, I’m just here having a quiet sing-along. I took the album with me to work and listened to it through my headphones. (My office is a cubicle farm and, until six months ago, I worked in a cubicle. Headphones were necessary to be polite to others.) It ran in the background as I wrote. It was the second or third time through that I reached a mental break moment in my writing, and it just so happened that the song playing was “The Loneliness of a Tower Crane Driver.” I listened to it — “This is interesting,” I thought — and I felt the overwhelming sense of despair in the song. Then it hit the moment where the texture of the song changes, a moment of hope, and it felt as though the sun had come out. I wept. 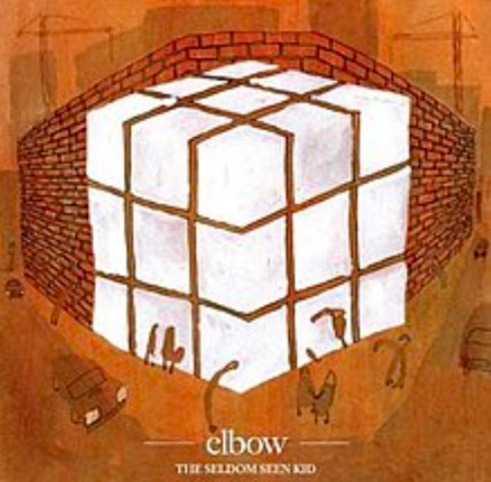 The Seldom Seen Kid may not be Elbow’s best album in my estimation (depending on my mood, I’d rank it third at worst), but it’s probably their most accessible. Indeed, there are better albums and there are much better lyrics and songs, some of them maudlin and some uplifting, this was a really good entry into enjoying their whole range. 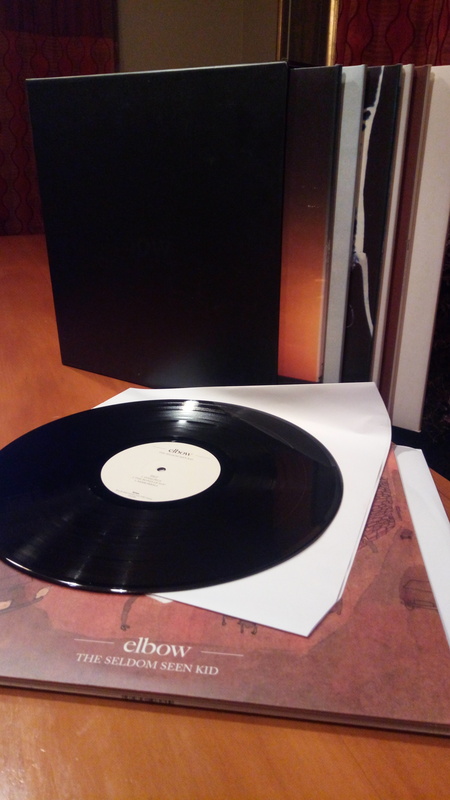 This entry was posted on May 12, 2018 by Philip Walter in Beer, Beer of New Zealand, Challenge, Garage Project, Imperial/Double IPA, Justsaying, Nostalgia, Singing on the bus, Vinyl and tagged Elbow, Garage Project - Lupus the Wolf Man, Lupus the Wolf Man, The Seldom Seen Kid.